Many vehicles throughout automotive history have used “sport” and “lightweight” in their names, and the Mercedes-Benz SL-Class is one of them. The first generation Mercedes-Benz SL rolled off the assembly lines in 1952 and has given birth to such icons as the 300SL Gullwing and Roadster. Now, six decades after the initial launch the sixth generation SL promises to return to its roots with a renewed attention to increased performance and reduced weight. 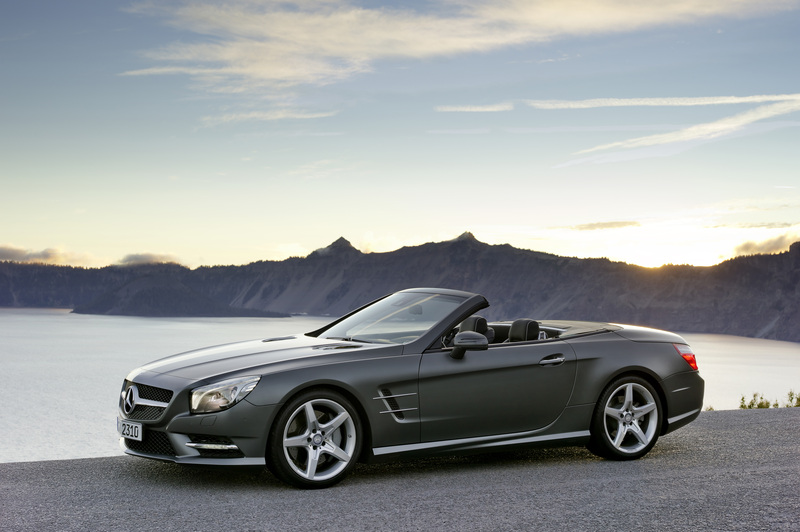 The new 2013 SL550 is the first production-based Mercedes to feature an all-aluminum body structure. Steel is only used in the A-pillar for added safety in the event of a crash. Besides the extensive use of lightweight aluminum, panels behind the roof and gas tank employ even lighter magnesium in their construction, helping to reduce the weight even further. Ok, that’s one half of the “SL” concept. But the “sport” dimension of the vehicle has been upgraded and improved too. 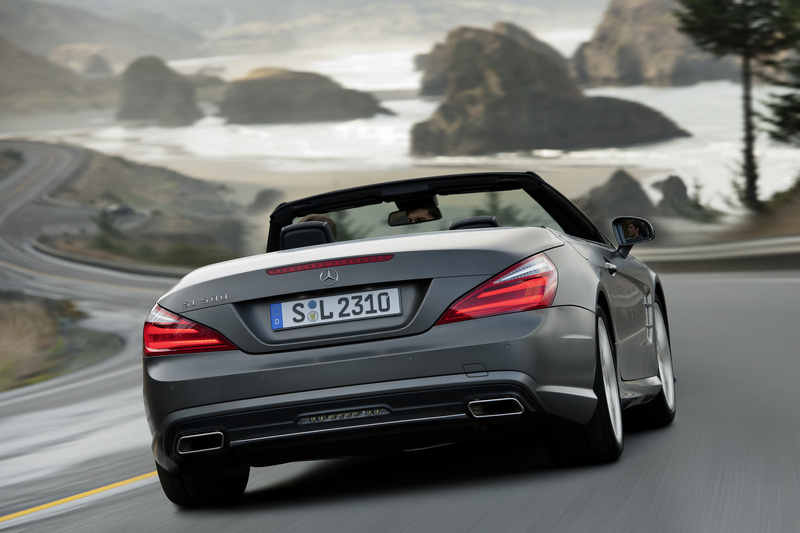 The 2013 SL550 has received significant changes under the hood and throughout the vehicle’s suspension. A new 4.6-liter V8 has replaced the outgoing 5.4-liter unit. Despite decreasing the overall displacement by 0.8 liters, peak output has increased to 429 horsepower. The amount of torque produced has jumped dramatically, increasing 32 percent, from 391 lb-ft to 516 lb-ft, thanks in large part to the addition of twin turbochargers, allowing the engine to produce large amounts of torque at relatively low rpms. Mercedes claims the 2013 SL550 will sprint from 0-60 mph in just 4.5 seconds, 0.8 seconds less than the previous model. Although no official figures have been released fuel economy and overall efficiency has supposedly inccreased as well, with the help of a ECO stop/start function and an economically 7-Speed Driver-Adaptive automatic transmission. On the interior passengers can expect to have increased room and maneuverability as a result of the exterior’s greater dimensions. The spacious and luxurious interior the 2013 SL550 also features a retractable hard top that can be opened or closed in less than 20 seconds. On top of the SL550’s already technologically-laden design are two all-new features, FrontBass and Magic Vision Control (MVC). FrontBass takes advantage of the spaces in front of the footwell. This area is where the woofers amplify the bass sound from the speakers, thus making for a high quality audio experience even when the roof is down. The second feature, Magic Vision Control is essentially a high-tech windshield wiper system. MVC dispenses washing fiuld onto the windshield in both directions of travel, allowing for reduced splatter and risk of over spray when driving with the top down. The MVC system also heats the fluid and wiper blade itself, which should come in handy getting rid of snow and ice during winter months. The 2013 SL550 will be available in U.S. showrooms beginning in the Spring. Along with the initial launch Mercedes will be offering a special “Edition 1” model. The “Edition 1” includes unique features such as AMG 19-inch alloy wheels, designo exclusive leather with contrasting topstitching, AIRSCARF and Harman/Kardon surround sound system. The exterior is finished in special designo crystal silver magno paintwork and the interior upholstery is covered in designo classic red/black leather with designo black piano lacquer wood trim.